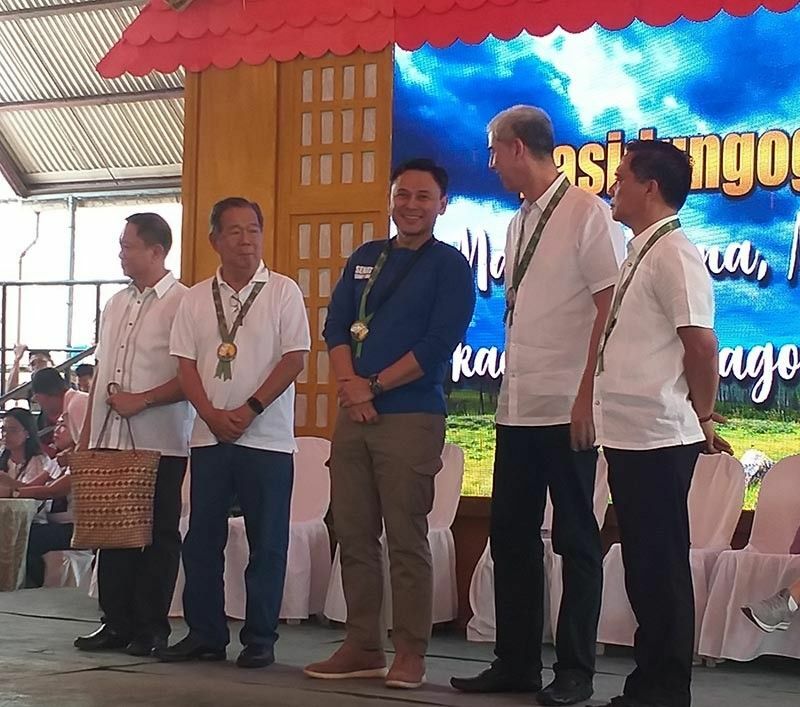 Senator Juan Edgardo Angara (center) with Governor Alfredo Marañon Jr. (second from left) and Vice Governor Eugenio Jose Lacson (second from right) during the 2019 Pasidungog sa Panguma, Pangisda kag Pangkasapatan at Panaad Park in Bacolod City on Saturday. Also in photo, Provincial Agriculturist Japhet Masculino (left) and Provincial Veterinarian Renante Decena (right). AMID the challenges confronting the country's agriculture sector, a national official stressed the need for the government to prioritize local farmers through one, being cautious in implementing measures on importation. Senator Juan Edgardo Angara, who spoke at the awarding ceremony of the 2019 Pasidungog sa Panguma, Pangisda kag Pangkasapatan at Panaad Park in Bacolod City on Saturday, said the country is facing a lot of challenges especially on importation. Angara said the government has already been doing such measure, but as representatives of the legislation they see the need to "slow down" or being cautious about it. "We need to look at carefully the tariff, and prioritize and protect our own farmers," he said, adding that if local farmers are not supported, they will lose in the import market. Thus, there is really a need for the government to fight for Filipino farmers, the senator stressed. Latest report of the Philippine Statistics Authority (PSA) showed that the country's total external trade in goods in February 2019 amounted to 13.14 billion US dollars. The figure reflects an increment of 1.2 percent from the 12.99 billion US dollars recorded value during the same month of the previous year. Of the total external trade, 5.18 billion US dollars or 39.4 percent were exported goods and 7.97 billion US dollars or 60.6 percent were imported goods. Reports further showed that the country’s balance of trade in goods increased to a 2.79-billion US dollar deficit in February 2019, from 2.54-billion US dollar deficit in February 2018. Among the agricultural goods which the country has been importing is rice. In fact, importation measure on this commodity has been recently modified. On February 15, President Rodrigo Duterte signed Republic Act 11203, or the Rice Tariffication Act. More than a month after, on April 1, the National Economic and Development Authority and the Department of Budget and Management signed its implementing rules and regulations (IRR). The measure will result in a switch from the previous quota system in importing rice to a tariff system, where rice can be imported more freely. The law allows unlimited rice importation, but investors must first secure a phytosanitary permit from the Bureau of Plant Industry and pay the 35-percent tariff for shipments from Southeast Asia. This is expected to result in a decline of as much as P7 per kilogram in the domestic retail price of rice. The country's economic managers are also pushing for the liberalization of sugar importation. They believed that there's a need to relax the rules on importation that puts pressure on the domestic economy to compete with the rest of the world. Oppositions though arose from industry stakeholders, especially in Negros Occidental, as well as in the government including the senate. For Angara, who is one of the 10 senators who signed a resolution opposing the proposed the sugar import liberalization plan, said local industries should be protected. In agriculture, for instance, the government has become "fond" of importation, he said. "We need to change our approach because importation hurts our farmers," Angara said, pointing out that "we will import without helping first local producers, it seems wrong."